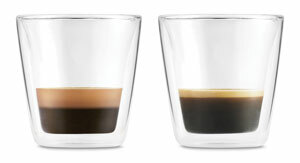 The difference is clear: espresso made from beans ground one minute ago (left) produces crema that is noticeably more rich and thick than espresso made from beans ground ten days ago (right). The verdict? Fresh beans are always preferable. 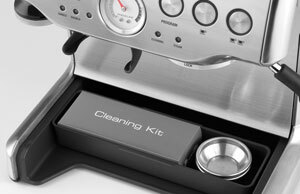 Convenient hidden storage compartment for the filters and included cleaning kit. In the world of coffee, freshness can be measured in seconds. By the time even five minutes has passed, ground beans have started to lose their flavor. Grinding beans every time you want fresh espresso takes time, though, and oftentimes it becomes a tradeoff between taste and convenience. 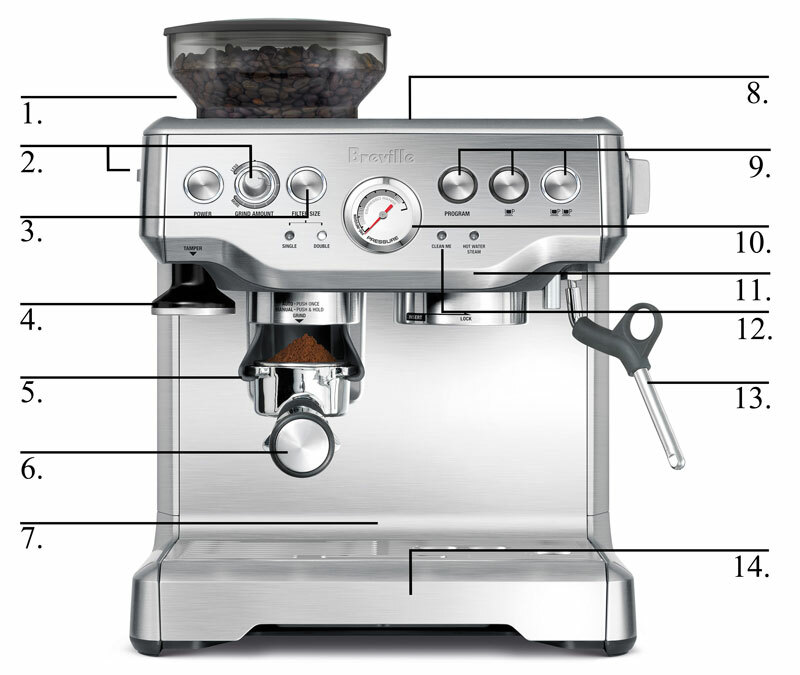 The Breville Barista Express solves this problem, delivering fresh, quality espresso at remarkable speed, thanks to its integrated burr grinder. Go from beans to espresso in under a minute—all in the comfort of your own home. Espresso making is notorious for being both an art and a science, requiring you to carefully adjust each of the inputs (grind size, grind amount, etc.). But even complete beginners and aspiring baristas can pull a perfect shot from the Breville Barista Express. For beginners, it comes with two dual-wall, pressurized filters that regulate pressure and help optimize the extraction. For more experienced baristas, the Barista Express includes two single-wall, non-pressurized filters that give you more room to experiment with different grind sizes, grind amounts, and tamping pressure. As either a crash-course or a continuation study, the Barista Express gives you free rein to explore the art of espresso. In addition to its integrated burr grinder, the Breville Barista Express has an Italian-manufactured 15 bar pump and thermocoil heating system that ensures accurate regulation of water temperature for a full-flavored espresso. A pre-brew function and flat shower head make sure that the water is optimally distributed through the coffee puck. The Barista Express also has several helpful features, such as a cup warmer on the top of the machine and a feature that removes excess water from the filter basket after coffee extraction, so the used grounds form a dry puck for quicker cleanup. Lastly, it has a stainless steel 360 degree swivel-action steam wand for lattes and cappuccinos. For beginners and aspiring baristas alike, the Barista Express makes good espresso accessible and easy to make. Integrated conical burr grinder and half-pound bean hopper: stainless steel conical burrs optimize extraction of flavor from the bean by maximizing the surface area of the grinds. Use freshly ground beans for every shot for more full espresso flavor. Hopper has locking system for easy removal, storage and transfer of coffee beans. Grind size and grind amount selector dials: choose among grind settings from fine to coarse and adjust the amount of freshly ground espresso dosed into the filter basket. Filter size button: indicate whether you are using a single- or double-wall filter basket and the grinder will dispense the required amount of ground coffee for the appropriate filter type. 54mm tamper: for expert tamping control. With magnetized storage, but removable for easy tamping. Hands-free grinding cradle: push portafilter into cradle and freshly ground espresso will be dispensed directly into the filter. 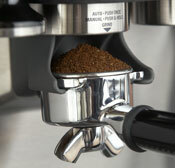 Grinder automatically stops when the indicated amount has been dispensed. 54mm stainless steel portafilter: with commercial style spouts. 67 fl. oz. removable water tank: top-fill tank with replaceable water filter to reduce impurities and scale. Volumetric control: preset 1 and 2 cup volumes, manual over-ride, or reprogrammable shot volumes. Espresso pressure gauge: monitors espresso extraction pressure. Thermocoil heating system: integrated stainless steel water coil accurately controls water temperature. Clean me light: indicates when a cleaning cycle is required. Cleaning kit included. 360-degree swivel action steam wand: for effortless milk texturing. Auto purge function: automatically adjusts water temperature after steam for optimal espresso extraction temperature. Removable drip tray: partitioned for both wet and dry spills, with ‘Empty me!’ indicator for when it’s full.